With cameras getting bigger and better HD video recording and burst shooting features all the time, some of them need the write speeds the current generations of SD cards provide. So here's a roundup of the fastest SD cards based on my independent tests. I try to test as many SD cards as I can. This post is based on the results of those tests. My focus here is on SD cards that are well-suited to using in cameras for recording video or burst sequences of photos. These are the current top 5 fastest SD cards so far according to my independent speed tests of sequential write speed. This is the metric that's most relevant to recording 4K, 8K, and high-bitrate video as well as fast photo burst modes. Here's some more detailed information on each of the fastest SD cards I've tested. This card is the one with the V90 rating, and it's available in 64GB, 128GB, and 256GB versions. There's also a V60 version which isn't quite as quick as this one but still has very high performance. It comes with a link to file recovery software and a 5-year limited warranty. It doesn't come with a card reader. This one also comes with its own USB thumbdrive card reader, which also happens to be one of the fastest SD readers I've come across yet. Performance-wise, I found this card to be very close to the Lexar 2000x. But it falls short regarding value--it's consistently significantly more expensive than some of the other lines. It comes in 16GB, 32GB, 64GB, and 128GB versions. The SanDisk Extreme Pro badge is for SanDisk's top-of-the-line range. These are reliably solid performers from a top-notch flash memory brand. SanDisk tends to refresh their product line much more frequently than many of their competitors, but they reuse the same series names (eg. Extreme Pro). Performance is typically very consistent from model to model, so they're a very good, reliable option. It comes in 32GB, 64GB, and 128GB versions. Does the Speed of SD Cards Matter? But it's not always true that the fastest card is necessarily the best card for what you need. Price and availability matter too. And then there's the important issue of whether your camera can take full advantage of the card's speed. In most cases, you can safely put a very fast card in a slower camera, but it doesn't always work that you'll get much benefit from the fastest card in the camera. It depends on what you're putting it in. To take advantage of what UHS-II cards can do, for instance, you'll need a camera or reader that's compatible with UHS-II. If it's not, the card will still work--they're designed to be backward compatible in nearly all cases--but you won't get the highest speeds the card is capable of. One place you might see some benefit, though, is when you go to download the photos from the card to your computer using a card reader. These are sorted by default by descending sequential write speed, but you can click on the column headers to sort by other criteria or use the search bar to filter by brand, etc. You can also scroll the table right to get the other columns. This obviously doesn't include every SD card available. It's a growing list that's a work-in-progress, and I'm adding new cards as I get the opportunity to test them. I'm putting the priority on cards that are readily available and from major manufacturers. If you have one you're interested in that's not on the list, by all means drop a note in the comments. I can't promise I can get to every card, but I can try. Like everything else in electronics, memory cards come with a cloud of jargon. Here are some brief explanations of what the various bits and pieces mean. SDXC (Secure Digital eXtended Capacity) refers to SD cards with a capacity larger than 32GB. They're formatted in the exFAT filesystem. For practical purposes, the most common currently are Class 10, U1, U3, V30, V60, and V90, with V60 and V90 being the current fastest classes. It is technically still possible to find older, slower cards that are Class 2, 4, or 6, but most modern cameras are likely to work better with at least Class 10 cards, especially for recording video. What is the A Rating (e.g. A1 and A2)? So the new A specification (for App Performance) incorporates the random read/write speed. If you're buying a memory card for a camera, it's not especially relevant because what's requires on those is sequential speed. So if you’re recording video (or shooting photos), the speed classes you want to look for are the ones starting with V (e.g. V30 or V60) or U (U1 or U3). But if you're buying a memory card for a gaming device or smartphone or some other kind of device that runs apps and uses SD or microSD memory cards, the A rating is designed as a guide for what cards are best suited to that kind of use. The speed of SD cards has come along in leaps and bounds in the past few years. At the moment, the fastest SD cards are faster than the fastest microSD cards, faster than the fastest CompactFlash cards3, and slower than CFAST 2.0 and XQD 2.0 cards. It's always best practice to format memory cards in the camera you're going to use them in, but if that's not possible or not what you want to do, you can also format cards using a computer. But there are some things to know when formatting SD cards to minimize the risks of your camera having problems with them. So I've put together guides on how to format SD cards on Mac and how to use the free SD Card Formatter app for Windows or Mac. You have certainly provided us with a lot of Excellent information. However one item does not appear quite right. You list the Samsung EVO @ 87.2 MB/sec. Sequential Write and their EVO Select @ 70.3 MB/sec. Sequential Write. Hi Den. I just went ahead and retested that card and am getting much the same results. Samsung does recycle their names, and there are older U1 EVO cards around. I've gotten similar slower speeds with the older cards, but I'm getting the faster results from the newer U3 version. Kudos for the great research! I'm leaning toward the Sony card for my Fuji X-T3 but this American made card seems very capable as well. ProGrade Digital 64GB UHS-II SDXC Memory Card. Have you heard of it and might you be testing it? I haven't tried that one yet, but I've just ordered a couple to test out. Should have results posted later this week. Thanks for the tip! Thanks David! I am now subscribed for updates to you web site. Thanks for the tip on these. I've now tested them, and the V90 jumped right to the top spot. The V60 also performs very well. Hello! Have you tried the ADATA Premier ONE (128GB) Class 10 UHS-II ?? Would be awesome to see how it compares to the TOP Sony. I haven't, but will add to the test queue. Have you had a change to try the Adata SD Cards? Hi David! Can you throw your 2 cents in for me? Have a Sony A99ii a-mount full frame DSLR, dual card slots. Choosing between SanDisk Extreme Pro (SDSDXXG) and Sony SF-M64/T. Sony obviously has the faster read speed and is supposedly built like a tank, but where the camera is not UHSII, I've read that the SanDisk will outperform the Sony for write speed and general performance. Thoughts? Great article by the way! I just purchased a Sony DSC -HX90V camera and it was to include a transcend SDHC 300x UHS-1 class 10 but instead it came with a SanDisk Ultra SDHC UHS-1 320x. Both 32GB. Hi, I just bought the GoPro Pero 5 and a guys told me to bought the microSd Sandisk extreme 64GB 4k UHD, V30 speed up to 100 MG/s 667X.and Im not sure to use it because my friends said that the speed should be up to 90MG/s. Im confused. What do you recommend according to the speed up to 100? The card you have already is plenty fast enough for the HERO5 Black, so you should be all set to go. According to the spec sheet: "Warranty and support. All Lexar Professional line memory cards come with a limited lifetime warranty and are backed by expert technical support." Fine print at the bottom says that in Germany that's limited to 10 years from date of purchase. This is is very useful site of yours! My camera manufacturer is recommending an SD Card with Video Speed Class 60 or higher. I've got the Lexmar LSD64GCRBEU1000 card which I think is the larger version of the 32Gb card you have tested. Would the test results be the same for my card? So long as they're the same generation of update, I've generally found only negligible differences in different sizes. So it should be the same or so close to it as to not make any practical difference. But you mention Video Speed Class 60. That's quite a new speed rating system that is still rolling out, and while cards with that new rating do exist, they're fairly rare for now. For cameras like the new GH5 that have ultra-high resolution video codecs, the faster cards like the Lexar 2000x will be safer options. It's the Panny GH5 I have. Are you able to advise what the specification is of these Class 60 cards ie. min read/write speeds? The V60 refers to cards that are rated for sustained sequential write speeds of at least 60 MB/s. hello.is ld,netac,mixza brand recommend for xiaomi yi2 4k action cam? Are the list of the Detailed Test Results shown for speed of 128 GB SD cards or speed of 68 GB SD cards?? Dear Sir, pardon my ignorance, the column header named "tested write ran" what means?, my question is directed to SanDisk UHS II card. Thanks. The tested speed of random writing to the card, which puts small chunks of data at different places of the card. It's typically much slower than sequential writing, but also much less relevant for these types of uses. Is Samsung evo 65 gb and class 10 good for cell phones? Would you have a similar comparison for microSD cards? I am looking for one in 128GB density that that can ideally do ~75Mbps read and ~ 50Mbps write. I have searched extensively and all I have found so far is limited to 64GB density. Any help is greatly appreciated! Thanks! Yes, all the readily available 128GB microSD cards that I know of are slower, with the 32GB and 64GB offering the fastest speeds. Hello David. First off all, thanks for your great Work. I am a bit lost because I don't Know wich card is the optimal for my camera. I've just bought a nikkon L840 that records full HD stereo video 16 mpix camera resolution. I don't want to waste my money but I want to buy a good memory card. What do you think about it? Wich is the best of the list following these conditions? Hi your list of cards and speeds says the Lexar Professional 2000x card has a read speed of 300 Mb/s and a write speed of >30 Mb/s. I was going to send back the card because the write speed was so slow but the packaging says 260 Mb/s write and 300 Mb/s read and that is what Lexar confirmed when I contacted their technical support. You might want to correct that on your list. Thanks for all the info. Thanks for the tip. That's a consequence of Lexar not publishing the write speeds but simply saying that "write speeds slower" on all their specs. Which is why I had listed it as 'greater than 30 MB/s' (>30MB/s) because it had to be to qualify for that class of card but I couldn't say reliably what the actual speed is. It's interesting that they've started adding it now to the packaging--I believe that's a new thing for Lexar cards--and I've updated the info above accordingly and spelled out the greater than symbols to prevent any confusion. Hi David, you probably need OS X or Win 8 to speed up USB 3.0 with UASP. What they say about the speed is true with Lexar UHS-Ii card reader. Lexar 64GB 300MB/s (2000x)? (Amazon, B&H, etc has). Is there a way to tell how much slower or some approx a UHS-II U3 card will be in a UHS-l camera. I bought a camera in January but would have held out if I knew about these cards. For example a 150MBs card would write at what speed in say a Nikon 5300. There is one for a low price I can get, if worth it. Then again I may not be able to afford a UHS-ll camera. The D5300 is reportedly capable of writing at speeds of around 50 MB/s, so something like the SanDisk Extreme Pro or faster should get the maximum speed out of it. Ultimately, though, it's determined by the camera itself and varies by camera. Thank you David for the helpful information. I think you mention in the article they give the same name to cards that have different spreeds. I looked up Sandisk Pro and found a few speeds. Anyway. It;s moot. 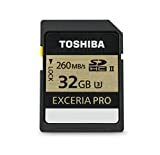 Amazon.ca is having special deals for Prime members and I had to buy a 32GB Lexar Professional 150 MBs for 23.99, free 2 day shipping. So even if it doesn't help me with my current camera. If I upgrade I will have a pretty fast card ready. The Lexar is an excellent card and should serve you well. I bought this one for my Nikon D5300..
Is it a good one or i would have any problem? They're excellent cards and you should find it to work very well. Super important but missing metric is the power consumption of various SD cards, since will significantly affect device battery life for extended recording (like HD video, etc.) Power consumption should not vary too much within same manufacturer model for different memory sizes, but SDXC may be different than SDHC, and power per gigabyte stored/retrieved (which is a good way to measure it since data rates vary) will be different for different card manufacturers and even different models within same manufacturer since depends on recording/retrieval circuitry. It would be uber helpful if you can add into the comparison power consumption metric (per GB stored) for each of these cards. Agreed--I've always found Lexar cards to be excellent.